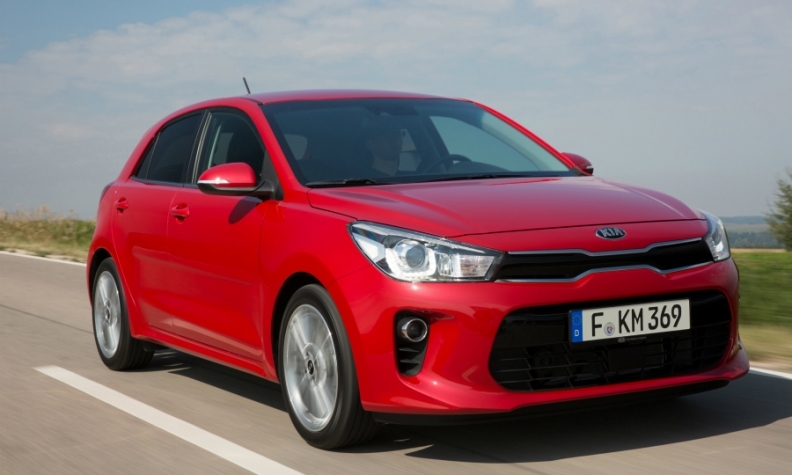 The new Rio will play a bigger role in boosting Kia's sales in Europe. LISBON -- Kia is stepping up its product offensive in Europe with the launches of new models such as a small SUV, a sporty sedan and replacements for its Rio and Picanto cars. The brand plans to introduce 22 new or replacement models, facelifts and derivatives in Europe through 2020, starting with the fourth-generation Rio subcompact, said Steffen Cost, managing director of Kia Germany. "That means picking up the pace a step over what we had in the past," Cost told reporters on the sidelines of a test drive of the latest Rio in Lisbon, referring to the introduction of 26 models in Europe over the last six years. During that period, new registrations of Kia cars in the EU increased 64 percent over the volume achieved in 2010 compared to a 9.6 percent growth in the overall market, according to industry figures from European association ACEA. The product offensive includes the Stinger four-door fastback, which will go on sale in Europe in the fourth quarter and serve as a halo model for the brand. The Stinger debuted at the Detroit auto show in January. It shares a new rear-wheel-drive platform with parent Hyundai Motor's upcoming Genesis G70 model. Kia's latest Picanto minicar will go on sale in the spring after its debut at the Geneva show next month. Kia said last month that it will debut a subcompact SUV later this year. The SUV will give the brand a competitor to models such as the Nissan Juke in a booming segment. The Rio is Kia's best-selling model globally, but a slow-seller in Europe, where the new version is rolling out this month. To better compete against traditional brands strong in the subcompact segment, Kia has given the Rio a fresher look and added improved connectivity and safety features such as autonomous emergency braking more commonplace in larger cars. Cost said the Rio will play a more important role in the brand's model range because its new design and advanced safety assistance features will help the car appeal to of a wider customer group. Kia's product offensive also includes models such as the upcoming plug-in hybrid versions of the Optima wagon and Niro crossover. With over 3 million vehicles sold last year, Kia is the world's ninth-largest automaker in the world. Together with sister brand Hyundai, the two Hyundai Motor brands climb into the top five. Last year Kia's market share in the EU and EFTA markets increased by 20 basis points to 2.9 percent last year after its new-car registrations rose 13.1 percent to 435,316 vehicles, according to ACEA data. In January, Kia Europe Chief Operating Officer Michael Cole said he was targeting a sales gain of more than 5.7 percent to more than 460,000 cars in the region this year to meet its target for a 3 percent market share in the medium term.